Look at it. It was once a wilderness, now it’s a garden. Aren’t you proud? Even as he solemnly declares the old West dead, John Ford reaffirms the myth’s immortality exemplified by the now legendary words of the Shinbone Star editor towards the end of The Man Who Shot Liberty Valance, “This is the West, sir. When the legend becomes fact, print the legend.” (1) And yet, from the very beginning the film’s mise en scène undercuts the myth’s immortality, providing visual evidence of the reification of myth into historical fact and of the inevitability of the new social order. There are no breathtaking vistas, no heart-stopping chases across the vast expanses of the desert. The real desert has already shrunk down to a symbol: the wild cactus roses growing among the ruins of Tom’s unfinished house, or the single cactus rose Hallie leaves on the tomb of “the old West” (Tom’s coffin). Instead of long panning and travelling shots bringing out the sublimity of the Southwest, we are “treated” to long debates, set in crowded and enclosed public spaces (the bar, the newspaper office, the election hall) about statehood, law, progress and the role of the press in the making of history. The film, whose flashback structure evokes Citizen Kane (Orson Welles, 1941), unfolds like a chamber drama, with Liberty Valance and his gang providing the only (maniacal) respite from the invisible tyranny of public life, to which even Tom seems to have resigned himself. The world of Shinbone is the world of the mundane and the insignificant: men sit around, eat, cook, wash dishes, or give speeches; at the heart of the town is not the saloon with its ritualistic brawls and exciting, impulsive shoot-outs, but the kitchen of the respectable establishment run by a couple of practical minded Swedish immigrants. The talk is mostly of steaks and fried beans; no one pulls out a gun, except for Liberty Valance (Lee Marvin) and Tom Doniphon (John Wayne) (2). In the opinion of many genre critics the Western satisfies particular social needs. Will Wright, in his well-known study of the Western, Six Guns and Society: A Structural Study of the Western, suggests the genre: 1) dramatises the conflict between law and morality or “the conflict between the ethic of work and the ethic of leisure”; 2) represents “a legitimation of violence in a context of Puritan control over feelings”; 3) “affirms the necessity of society” by presenting and resolving “the conflict between key American values like progress and success and the lost virtues of individual honor, heroism and natural freedom”; and 4) “opposes Wilderness to Civilization in the contrasting images of the Garden and the Desert” (3). Wright also distinguishes four periods in the genre’s evolution: 1) the classical plot (1930 to 1955) that focuses on a lone gunfighter saving the town from the villains (gamblers or ranchers); 2) the vengeance variation (1955-1960) that features the hero, failing to adjust to society, seeking vengeance; 3) the transitional phase (early 1950s) in which the hero defends justice but is ultimately rejected by society; 4) the professional plot (1958 to 1970) where the hero is replaced by a group of professional gunfighters who “defend” society in exchange for money rather than out of love for, or commitment to, any ideals of law and justice (4). Ford’s film does not belong to any of these phases, though it combines aspects of all four of them. One of the difficulties in categorising The Man Who Shot Liberty Valance stems from the uncertainty of the hero’s identity. The classical Western plot (5) is here skewed by the presence of what appears to be an anti-hero, Ransom Stoddard (James Stewart), who is neither a hero nor a villain. Alternatively, we might argue that we are dealing with a split protagonist (Stoddard and Doniphon collapsed into the figure of the hero), each of whose sides represents some of the characteristics of the Western hero while contradicting others (6). On the one hand, the hero appears to be Stoddard: he arrives from out of town and takes it upon himself to protect the community from the outlaw Liberty Valance. However, unlike the lonesome, rugged gunslinger who rides into town unexpectedly, Stoddard arrives in town from the wrong direction (East), beaten unconscious and in need of immediate medical attention, while the skills that are supposed to grant him a special status in society (following Wright’s account of the classical plot) are, to say the least, unusual (he is a lawyer, not a gunslinger). Stoddard’s association with the East emphasises the new “feminised masculinity” he will come to represent. In most Westerns it is the heroine, not the hero, who arrives from the East, which is always associated with “weakness, cowardice, selfishness, or arrogance” (7). On the other hand, Doniphon seems to fit the Western hero perfectly for he is one of the two toughest men “south of the picket wire” (the other one being Liberty Valance); however, unlike the classical hero, Doniphon is not positioned outside civilisation – he lives a more or less settled life and is widely assumed to be the only local authority capable of keeping the villains in check. Indeed, the gunslinger and the outlaw are here positioned on the same side insofar as both Tom and Liberty stand for “Western law” – i.e. every man living according to his private moral (Tom) or amoral (Liberty) code – while Stoddard represents “The Law”. Both Tom and Liberty belong to a fast disappearing old frontier world (the outlaw’s name refers to the two fundamental values of that world: liberty and valiance), in which human life counts for little and all conflicts are resolved in the most direct, immediate way (i.e., with a gun). In fact, Liberty embodies the wandering, unsettled lifestyle usually associated with the Western hero: for example, when he arrives at the election venue and the townspeople try to stop him from registering “because he does not live south of the picket wire”, he proclaims, “I live where I hang my hat”. At the same time, however, his character anticipates the profit-minded gunslinger of “the professional plot” in that his “loyalties” remain undefined: it is only when he fails to have himself elected as a delegate to represent the farmers’ struggle for statehood that he starts recruiting hired guns to defend the big ranchers’ interests. Lee Marvin’s performance deliberately turns Liberty into a jester rather than a psychopath (8). His demeanour, in combination with his outfit – sporting a ridiculous cowboy outfit he seems to have stepped right out of a children’s Wild West story – emphasises the playful, carnivalesque aspect of the character. The scenes in which he and Tom square-off are built around Liberty’s zaniness and impulsiveness; indeed, the two “enemies” appear to take greater pleasure in self-preening and teasing each other – while humiliating Stoddard – than in actually thinking of ways to kill each other. Liberty is an integral part of life in Shinbone: he is more of a nuisance than a serious threat to the town’s survival. The main conflict in the film, then, is not that between the gunslinger Tom Doniphon and the outlaw Liberty Valance; the real conflict is that between “the Old West” (Doniphon and Valance) and the forces of “progress” (Stoddard). The evolution of the genre reflects the major change in American institutions in the forty years from the 1930s to the 1970s, “the change from a competitive market society to a planned corporate economy” (10). In the classical plot, the conflict between individualism and conformity is developed through the different uses of the land: the homesteaders want the land to build churches, schools and businesses, while the villains (the ranchers) want it for personal gain (i.e., they stand for “unbridled market self-interest” ). The classical Western represents “an aristocratic tendency with a democratic bias” (12): initially society grants the hero a special status but once he has saved them from the villains he is expected to surrender his special status and become equal with the other members of society (13). In the 1950s, Westerns became more critical of the settled frontier community whose conformism, selfishness and complacency paralleled too closely the qualities of the “lonely crowd” (14), the affluent, conformist middle class American society of the 1950s (15), and by the 1960s “the frontier environment of individual freedom and spontaneity [had become] less a precedent for a necessarily more structured, progressive civilization than a happier alternative to the confining, depersonalizing social order of today” (16). In this respect, the contrast in Ford’s film between the rugged frontier man who takes the law into his own hands (Tom) and the anti-hero (Ransom) whose special skill consists in knowing the law becomes significant. While the traditional Western hero possesses exclusive special skills of almost mythic proportions, Ransom’s special skills have been acquired (learned). The source of his skills, and thus of the special status enjoyed through their possession, is, theoretically at least, accessible to anyone; hence the emphasis on Ransom’s role as an educator: he teaches others to read and write, but also to know and apply the Law. Contrary to Tom, who is his own moral arbiter, Ransom preaches living according to common, impersonal laws, before which all men are equal and thus the same. The preoccupation with masculinity-in-crisis is also reflected in the uncharacteristic importance Ford ascribes to the romantic subplot, which once again skews the classical plot. All significant issues in the film – the vanishing of the old West, the territorial debates, the debates about law and order versus violence and vigilante justice – are in the end subordinated to the “love triangle” subplot. 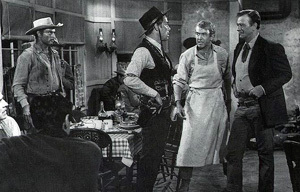 Tom makes that much clear in his last, crucial conversation with Ransom, when he admits that he killed Liberty Valance out of love for Hallie (Tom knew Hallie was in love with Ransom so he decided to save his life) rather than because he wanted to rid the town from the outlaw once and for all. Finally withdrawing from the courting duel, Tom tells Ransom that Hallie is his girl now, and that he should take that nomination, for now that he has taught her to read and write he ought to “give her something to read and write about”. The Man Who Shot Liberty Valance is a commentary on the relationship between myth and history, and between cinema and history; most potently, however, it is a funeral oration for the old, pre-modern technology frontier, for a vital past overshadowing the measly present, for the myth of the “Old Wild West”. The spectre of death hangs over the entire film: the austere coffin, the invisible corpse, the dust-covered carriage-turned-antique, the remains of Tom’s house, the wilderness-turned-garden-turned-wasteland – geographical, historical, psychological – left in the wake of the hero’s inevitable death. Melancholy is inherent in the odd temporality of the Western, which dramatises for contemporary audiences a world of the past, a world that is no more (19). Given the intertextual relationship between Westerns and Japanese samurai films (20), it is not surprising to find similarities between Ford’s film, an elegy to the myth of the old West, and Kurosawa’s The Seven Samurai (1954), an elegy to the vanishing warrior class and the samurai code. Both films deal with the passing of time, with the vanishing of a vital part of one’s national mythology, and with the reification of myth into history. The complexity of Ford’s film can be attributed to the tension between the tragic/heroic/epic mode, which affirms the noble individualism and the autonomy of the hero in the face of the petty historical circumstances that led to his death (21) – and which brings Ford close to Kurosawa – and, on the other hand, the melancholic mode, which emphasises the painful awareness of the passing of time, thereby bringing Ford closer to another Japanese master, Yasujiro Ozu (22). Ford’s film seems to say “everything passes away, even myths” and, at the same time, “myths transcend history”. The film provokes an emotional response familiar to viewers of Ozu’s films – “mono no aware” or an intuitive understanding of the cyclical nature of things, of the passing of time and its inevitability. And yet, while Ozu’s films encourage a Zen-like passive acceptance of the cyclical or transcendental view of time (provoking numerous critiques of the inherent conservatism of such a worldview), Ford offers us a realistic, steeped in historical detail account of the disappearance of myth only to resurrect that myth, which rises like a phoenix from the ashes of history, transcending any literary clichés used to describe its immortality. Although Ford’s film demonstrates the inability of one man to stop the inevitable course of history, it also reaffirms the transcendent power of myth over historical reality: Tom Doniphon might not have been strong enough to stop the march of history but he was strong enough to cast more than a “shadow of a doubt” on the belief in a post-mythical, enlightened, democratic America. See Lee Clark Mitchell, Westerns: Making the Man in Fiction and Film, The University of Chicago Press, Chicago, 1996. Mitchell argues that the film’s ironic tone works at every level to complicate the relation between history and myth at the heart of the Western, at once confirming and subverting the assertion by the newspaper editor, “When the legend becomes fact, print the legend”. Ford shows how “lies not only misrepresent but actively comprise history and refuses… to allow the fact instead to stand in for the legend” (23). Thus, he insists on both the fact and the legend. The film’s irony also draws attention to the “incoherence of the Western’s customary resolution (with masculine violence forced to establish the terms by which violence can be declared illegitimate)” (23). In fact, in spite of Tom’s protestations that he is the “toughest man south of the picket wire” and his reiterations of the absolute necessity of solving your problems with a gun, we never actually see him use his gun (except in the crucial flashback). Furthermore, the substitution motif (one man taking the place of another) does not refer only to Tom doing Ransom’s “dirty work” for him: on the two major occasions when Tom and Liberty confront each other – the steak scene and the nomination scene – and Liberty pulls out his gun, it is not Tom but his African-American friend Pompey who appears from nowhere pointing a gun at Liberty, ready to do Tom’s “dirty work”. Will Wright, Six Guns and Society: A Structural Study of the Western, University of California Press, Berkeley, 1975, pp. 6-7. Shane (George Stevens, 1954), The Man from Laramie (Anthony Mann, 1955), High Noon (Stanley Kramer, 1951), and Rio Bravo (Howard Hawks, 1958) exemplify, in turn, each of these phases. For a discussion of the classical plot, see Wright, pp. 48-49. When Stoddard’s enemies oppose his nomination they accuse him of killing a man (Liberty Valance). “What kind of lawyer is he?” the opposition asks. “He takes the law into his own hands. He has blood on his hands. The mark of Cain is on this man.” Here the film lends Stoddard’s unconscious betrayal of Doniphon and the latter’s downfall appropriately mythic (Biblical) dimensions. Wright, p. 57. Outside the Western genre, James Stewart often plays self-righteous men (in Alfred Hitchcock’s Rear Window , The Man Who Knew Too Much ) or men who are somehow incapacitated (Rear Window). Interestingly, his parts in previous Westerns – such as Anthony Mann’s Winchester ‘73 (1950), Bend of the River (1952), The Naked Spur (1953), The Far Country (1955), The Man from Laramie – tend to be much more heroic, in the traditional sense of the word, than Stoddard’s character. Lee Marvin was initially typecast as a heavy, in Westerns and crime dramas such as The Big Heat (Fritz Lang, 1953), Bad Day at Black Rock (John Sturges, 1955), and Seven Men from Now (Budd Boetticher, 1956). In the 1960s he “graduated” from villain to leading man in films such as Cat Ballou (Elliot Silverstein, 1965), Point Blank (John Boorman, 1967), The Dirty Dozen (Robert Aldrich, 1967), Hell in the Pacific (John Boorman, 1968), Paint Your Wagon (Joshua Logan, 1969) and Monte Walsh (William A. Fraker, 1970). John H. Lenihan, Showdown: Confronting Modern America in the Western Film, University of Illinois Press, Urbana, 1980, p. 15. The vengeance plot and the professional plot make the conflict between individual and society increasingly harder to resolve. See Wright, pp. 162-193. See David Riesman, The Lonely Crowd: A Study of the Changing American Character, Yale University Press, New Haven, Connecticut, 1965. Lenihan, p. 152. Of major importance in this transformation of the genre in the 1960s Westerns of Sergio Leone. The melancholic tone of the film has been interpreted as evidence of its self-reflexivity, and thus to position it as a “late Western” in the evolution of the genre, which, according to Thomas Schatz, can be divided into four phases: experimental, classical, refined and mannerist. However, Tag Gallagher has demonstrated that early westerns were often as self-conscious and parodic as “late” ones. Self-consciousness is erroneously assumed to have come only in the 1960s as a reaction to Hollywood classical cinema, while in reality the history of a genre suggests cyclicism rather than evolution (208). Specifically, Gallagher argues that Ford’s protagonists do not follow Schatz’s evolutionary model, “that is, electing civilization in early westerns, choosing wilderness in later westerns, remaining distinct from either civilization or wilderness in still later westerns” (210). For example, he writes, “Ransom Stoddard… spends a lifetime figuring out what everyone knows already in [the earlier] Stagecoach – that civilization is corrupting” (211). See Tag Gallagher, “Shoot-Out at the Genre Corral: Problems in the ‘Evolution’ of the Western”, Film Genre Reader, ed. Barry Keith Grant, University of Texas Press, Austin, 1986, pp. 202-217. As Mitchell points out, “Leone’s westerns were spoofs of the classical Hollywood western by way of recasting Japanese samurai films (themselves second generation Westerns) as serape swashbucklers” (239). The hero’s death, however, is not heroic: he does not die in a fight but from old age, sickness, or oblivion. Some have described the Western genre in general as a combination of the elegiac and the idyllic modes. See, for instance, Douglas Pye, “The Western (Genre and Movies)” Film Genre Reader, pp. 143-159.